Generally, I do not save things. I have a one year rule . . . If I haven’t worn it, used it, or looked at it in a year’s time, I want someone else to enjoy it. So I give clothes to charity, furniture to friends, and leave neatly boxed odds and ends in my alley for the “alley people.” These are the folks who drive through the ally looking for freebies and I am happy to oblige. My ally items are of the highest quality and always picked up quickly. It’s my presentation, clean, organized, and all items visible without having to dig around, it is not trash. The goods usually disappear before the sun goes down. Wherever their ultimate destination, it always warms my heart to know that my stuff gets a second chance to be loved by someone else. The one year rule does not apply to my sentimental treasures, particularly correspondence, letters, cards, texts, voice messages and emails, some of them decades old. I cherish them. I don’t read them often, but I do read them. I am usually looking for something else when I stumble across my keepsake boxes. I’ll open one, full of handwritten notes and cards from my children, my mom or dad, girlfriends, sibs, and former students, and before long, I am lost in the their writing and the memories. I love these boxes and the stories they keep, the feelings they convey . . . love, gratitude, sympathy, encouragement and inspiration. My emails are kept in neatly organized files in cyber space, one for travel, another for my remodel, one for family and friends, and several more. I have one very special file simply labeled Mom. 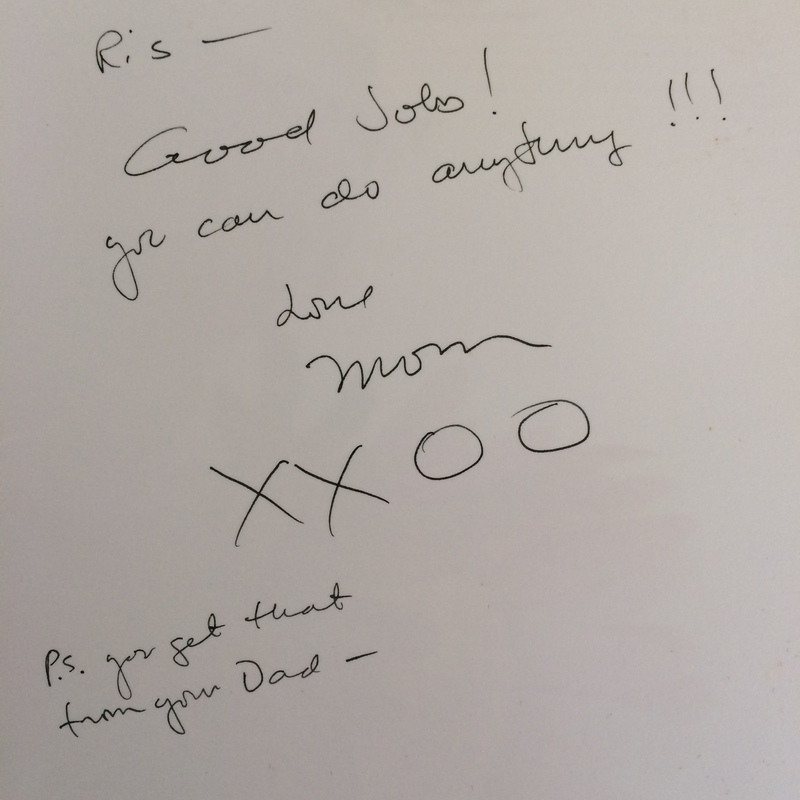 Here I saved an email journal I wrote over a 15 month period, updating family and friends, about my mom’s battle with cancer. I am not sure why I saved these, maybe because they tell her story of bravery. Maybe, I thought one day they would bring me comfort. I have only opened them once since I wrote them nearly seven years ago. Reading just a few was so painful, I had to stop. I know one day I’ll have the courage to read them all. When the time comes, I imagine my mom’s spirit and wisdom within me, giving me strength as the reason for saving these messages is revealed. I feel sure they have a purpose in this life of mine. I once saved a voicemail from my dad for nearly five years. After landing my first job as an elementary school principal, he left this message. . . .Christina . . . this is your dad. You’ve done well. I’m proud of you. If you get this message and it’s not too late, call me. Your mom and I would like to have dinner with you. Whenever, I retrieved my voice mails, I took the opportunity to listen to my dad’s message again and it always made me smile. After he died, I listened to it nearly everyday. It took on a different meaning . . . I missed him terribly and I wanted to hear the sound of his voice. . . . talking to me. A couple of years after he passed, I changed my internet provider. I realized too late that the change caused my cherished voicemail to be lost, deleted forever. I considered making a desperate call to the carrier and begging them to find my message. I thought again, and realized it was time to let it go. I can still hear my dad’s voice clearly in my head and feel his pride in my heart. Text messages are no different. I have saved more than I can count for their sentimental value, as well as their ability to make me laugh. I read and reread hysterically auto-corrected texts. Sometimes, my sister Mary and I will text each other hilarious little notes in the middle of the night, barely able to beat each other to the punch. While I am having a laughing fit alone in my bed another text comes through from my sister . . . I am having silent laughter and I can’t get a hold of myself! This of course makes me laugh harder. And when I’m feeling low, getting the occasional I’m thinking of you or a simple xo can really lift my spirits. I never tire of hearing the familiar ping, and receiving the gifts that follow. I learned that not everyone pours over their texts like a love sick teenager. A man I loved, once said to me, “I delete all my texts.” Pretending to hold his cell phone, he tapped his thumb in rapid succession indicating the deletion of a gazillion messages, and continued, “Oh yeah, it’s just too much stuff. Get rid of it.” And then he waved his hand dismissively in the air. In an instant, my heart sunk. How could he delete all of my heartfelt, carefully chosen words and pictures? I felt my face flush and hoped he didn’t notice. Texting was our main form of communication. He sent me many sweet messages, and I saved every single one. In the weeks between our visits, I missed him, and reading his texts was reassuring, he loved me. Often, he texted pictures of what he treasured, his girls and his friends, or a milestone captured that he wanted to share with me. The pictures were particularly intimate . . . they spoke to me . . . you are important . . . I am thinking about you . . . . I wish you were here . . . these are the people I love and you will love them too. I guess I got a little carried away. The relationship ended sadly, and abruptly. I have not been able to look at those messages, but I haven’t been able to delete them either. Perhaps there is a reason percolating for saving these messages as well . . . we’ll see. In the meantime, I still love and appreciate written and spoken words, and I am grateful for the people in my life who share them freely and honestly. I will continue to treasure them, save them, and savor them. ps . . . after writing this post I got the courage to look at my Mom file. I could only get through two emails and I chose this one to post . . .
She, Mary and my Dad met with the hospice nurse at 4:00, but not before my mom met with Father Christian and told him that she was ready to die. My mom agreed to hospice. I was at the house on and off today, but left before all of this happened. Although it was clear after this morning’s meeting that we were headed this direction. asked Mary to say the Rosary with her. She said she was exhausted by the day’s events and wanted to go to sleep. It’s been a long, long day. I believe every prayer has been heard and my mom is doing what is best for her. I’ve said it before and I’ll say it again – her strength is my strength. She is truly amazing. I can’t imagine there will be much to say in the coming days. Mostly, we’ll just be together. My mom loves when we are all together. Thank you for your continued prayers and support. Throughout this whole ordeal they have given us all strength, hope and I know eventually peace. I love that you have kept your letters and e-mails. They are treasures. Especially from and about your parents. When Basil’s mom was moving into our other house about 6 years ago we had to fit 3 households of stuff into 2 households. I started having free sales. I would make these vignettes of free things. Once I took a chair, table and lamp and created this little sitting area. It was gone w/in the hour. I had a continual free sale for weeks until people started added their junk to it. With teary eyes and tight throat, I acknowledge how even those painful momentos are treasures that I just can’t part with either. Your treasures are the ones that matter most. Still have my dad’s messages 3 years later, still can’t listen without aching, but very comforted knowing they are there. Just beautiful. Your writing hits my heart and I have tears streaming down my face. I can’t even fathom how one handles the death of their parent/s. I guess in time I may have to learn that, but God knows I don’t want to. My Dad’s having heart problems at the moment. Reblogged this on TIMOTHY WALLACE. This is beautiful. And I totally understand how this man made you feel. I admit, I could not read through your emails, re your mom, as it made me very sad. I love the fact that you keep them. And I am pretty sure, it is for a reason. I know how you feel. Stuff is just stuff, but memories are imbedded in the heart. I loved re-reading this blog. How things have changed in the last year. I love to listen to my dad’s message on my answering machine. He had just received the chocolate cookies that I made him and was eating one. His voice was still strong. I will treasure that message forever. I have a folder for everything, too. I love going back almost 20 years sometimes to see a different me! My favourite are the group emails I sent updating folks on my daughter’s progress in hospital.